Who would not love to revel in enthralling classic French bistro favorites while being surrounded by a relaxed and cozy atmosphere? 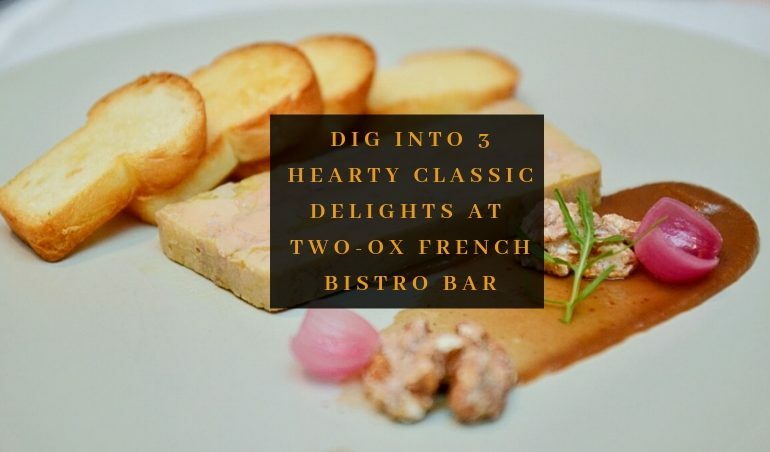 That’s why I was way more than excited to have a get-together with my colleagues last week at one of the trendiest bistro in Kuala Lumpur – Two-Ox French Bistro Bar. Situated at the revitalized culinary hub – The Row, Two-Ox French Bistro Bar boasts a French chic ambiance that would bring you to a beautiful Parisian cafe with its spacious yet intimate dining room! I was thrilled to find out that most of the ingredients are imported from different regions to ensure the best taste without losing the authenticity of French cuisine. What a meal to look forward to! We started our hearty affair with one of the exotic dishes here – Espresso Braised Beef. Simply presented, the beef totally got our attention for its irresistible aroma which was tempting enough to entice our taste buds. 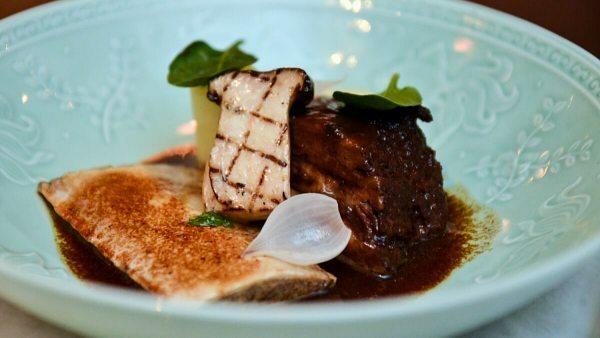 As its name suggests, the high-quality short ribs were slowly braised in bittersweet espresso sauce for hours before being served with fondant potatoes and king oyster mushrooms. The beef was a delight in the mouth as it had such tender goodness while its flavors nicely blended with the distinctly pleasant bitterness from the espresso. Something you should keep an eye on! Our next dish was the classic French dish – Duck Confit, which satiated our palate with its unique taste despite the unpretentious look. The duck leg was meticulously brined in salt, slowly braised in duck fat with fine herbs until it had a fall-off-the-bone texture. I was also impressed with the citrus duck glaze for its bursting flavors which was rave-worthy! 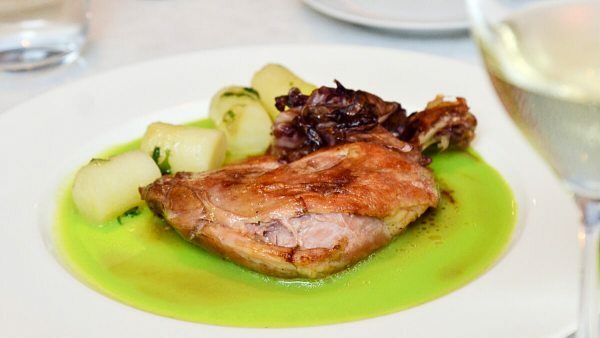 The flavorsome duck leg was served with asparagus coulis, potatoes and grilled radicchio, making it a divine dish for any foodies! 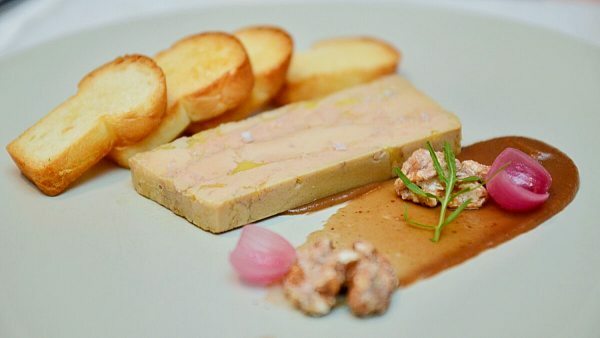 Finally, we ended our indulgence by treating ourselves to a gorgeous dish of Classic Foie Gras Terrine! As this signature dish is made of 100% pure foie gras, the chef had thoughtfully mixed the pungent pieces of foie gras with cognac before snug-fitted into a terrine for at least 3 days to maintain its richness while keeping it from being overwhelmed in flavors. Served with onion chutney and homemade brioche toast, this delicacy would make you crave forever more! TABLEAPP ELITE members can redeem these 3 dishes for free. Learn more about TABLEAPP ELITE here. Location: 56G, Jalan Doraisamy, 50300 Kuala Lumpur.